US University Bridge Collapse – Four Killed, 10 Injured ! 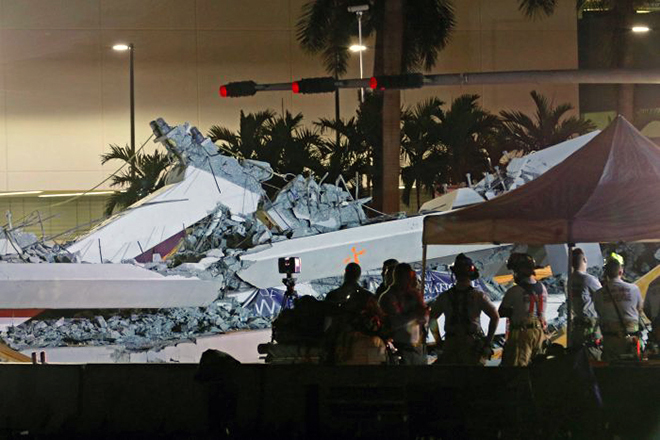 A pedastrian bridge collapsed near Florida International University in Miami in the US and about four people are dead and 10 others are injured after, US officials say. The structure toppled over an eight-lane motorway on Thursday afternoon, crushing at least eight vehicles, according to police. Rescue teams were still searching the rubble on Thursday night for victims trapped beneath the buckled footbridge. Still it is still unclear how many people were under the bridge at the time of collapse.